Want to know a great way to start your own day or someone else’s? Here you go: Make someone smile and laugh out loud! 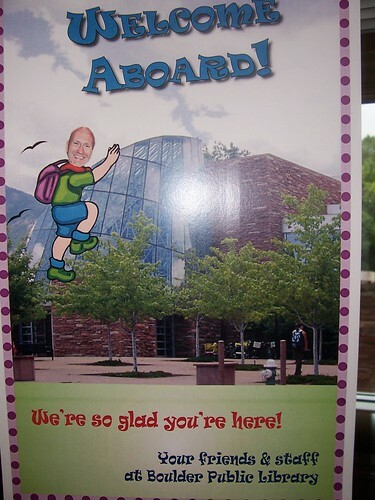 Here’s what I found on my office door this morning–my first day at Boulder Public Library. Thanks, BPL for making me smile, laugh and feel so welcome on this first day in a great city in a great library system! When I lived in Boulder in the late 90’s, I met a few nice people right away, and they introduced me to more, and so on… Pretty soon, I felt as if I had lived there for years. Never have I lived in a place with so many friendly people so willing to accept and welcome me – no questions asked. Enjoy your new town, and I hope that it treats you the way it treated me and so many others. Great to hear from you! It is a rare and wonderful feeling when you have to remind yourself you’ve only really lived in a place less than a week–feels like a year…everyone is so welcoming and generous with their thoughts (and smiles)! That really does mean quite a bit! I know that BPL users must be feeling this as well! And that means even more! How cool! What a fabulous place to work! It made me laugh out loud also. What a wonderful greeting. Happy first week. What a great welcome!! Hope all goes well. Hello Lynette! All is going splendidly. So much new information to take in, new people to meet and a new city to learn. All of it has been really quite wonderful! Good to hear from you. Hope things are going well! We miss you already! The Jellydots rocked Imaginon! My son even danced in the aisles! What a nice warm welcome! Boulder is lucky to have you!